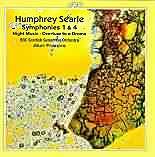 HUMPHREY SEARLE Symphony No 1 Op 23; Symphony No 4 Op 38; Night Music Op 2; Overture to a Drama Op 17 CPO 999 541-2 Symphony No 2 Op 27; Symphony No 3 Op 36; Symphony No 5 Op 43 CPO 999 375-2 BBC Scottish Symphony Orchestra, Alun Francis. 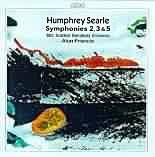 For that rare breed of discerning musicians, one of the great recording events of 1998 was the issue of all Searle's five symphonies. As Humphrey's friend, pupil and biographer may I lay to rest the curious falsehood and state that there is not a sixth symphony. When I spoke to Alun Francis in Berlin a few days ago I asked him why he had undertaken to record these symphonies. He replied modestly that he had always admired them because of their stunning originality. The first symphony was recorded by the LPO under Sir Adrian Boult in 1960 and Sir Adrian told us that while he was not in sympathy with the music it was 'a brilliant work teeming with invention'. The story about a BBC orchestra who threatened to go on strike if plans to play this piece went ahead is now well-known; it was so technically difficult. Boult's realisation was on the slow side and yet it captured the drama and power of this impressive score. Francis clearly understands the idiom far better and his speeds generally are more in keeping with the composer's intentions although I find the Adagio a shade fast so that when the concertante middle section appears, something of the high drama is lost. And yet his stirring final Allegro molto shows up Boult's cautious performances. This is both a splendid and important symphony. It is the first serial symphony by a British composer; it has the essential qualities of greatness in that it is original, structurally sound and faultlessly orchestrated; it has tremendous excitement and drama as well as sections of warm intimacy with brooding melodic lines. Hermann Scherchen gave the première and he is on record as saying that Searle is 'the greatest British composer since Purcell'. The German conductor also said, "Here is a composer who lives in the present, who has both the courage and integrity to write what he wants to write and does not bend the knee to musical fashion. He is a master, not a slave." The Symphony No 2 is Searle's most popular symphony, perhaps because it suggests a tonality of D although remaining serial. During the composition of this wonderful score, his first wife Lesley died and this was on Christmas Day, 1957. Yet the work is not a nauseating wallow but a tribute and is very positive. The outer movements are truly exhilarating and the slow movement has a melody of strange beauty which is also referred to in the finalé. The maestoso just before the end was once suggested to be reminiscent of Walton and so Humphrey revised this passage. Walton had music lessons from Searle for a few years after the Second World War, a vital fact which Michael Kennedy ignores in his book on Walton. Both composers were great friends and shared the wish to be original although Walton often "borrowed other people's tunes". There is a therapeutic glow about Searle's Second Symphony as there is about his other masterpiece written for Lesley, the Poem for 22 Solo Strings, Op 18. The Symphony No 3 dates from 1960 and is a fascinating work. The first movement is somewhat fragmentary but impressively sinister; the middle movement is a sparkling scherzo, although not everyone will see it like that, and it is a tour de force. I remember a concert conducted by Sir John Pritchard in which Lennox Berkeley's Serenade for Strings and the Elgar Cello Concerto were positively received and the last piece in the programme, Searle's Third, brought a standing ovation and demands for the central movement to be repeated. The finalé is possibly the most romantic movement Humphrey ever wrote. I am not quite sure it 'belongs' to the preceding movements but it is exceptionally beautiful dispelling all that verbal rubbish that 12-note music cannot have such qualities. I think that Alun Francis takes the scherzo a little on the slow side and he graciously accepted my observation. The revelation of this cycle however, is the Fourth Symphony, which is the hardest to assess. At least, it was until I heard this performance. I do not wish to bore readers with all the problems of this piece but rather say that the orchestra and conductor overcome all of them wonderfully well. And this says a lot for this orchestra. Frankly, if they can play Humphrey's symphonies, and they can, they can play anything. They are worthy of the highest praise. I heard them première David Dorward's splendid Symphony No 2, again under Alun Francis, and, yes, this is an unashamed hint that this work should be recorded. Searle's Symphony No 5 has risen in popularity over the last few years. It is a retrospective work recalling the composer's studies with Anton Webern and memories of Vienna before it was occupied by the Nazis. It is a work of mysterious shadows and has an enviable transparency. This is nostalgia without the wallowing. It is a pleasure to have the Night Piece Op 2 available since, like the Fifth Symphony, it is dedicated to Webern. In my view, it is in this piece that Francis and the Scottish Orchestra bring out the velvet romanticism of Searle. And to think he was called an avant-garde! The Overture to a Drama was premièred by Sargent at a Prom and savaged in the broadsheets at the time. One wonders why. It is a piece which aptly displays Humphrey's character. He was a man of tremendous humour with a wonderful capacity for friendship. He was not arrogant or pompous but modest and caring. He was precise and to the point, he was not a man of grand empty gestures. These two discs, which are available separately, are very welcome indeed. At last, a neglected master is now receiving the recognition he more than deserves and Britain's most original and courageous composer can now be heard, appraised and admired. But he is not a composer for the shallow or faint-hearted.